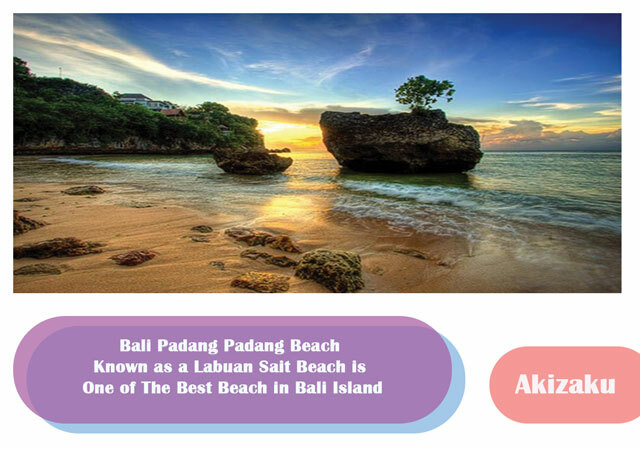 Bali Padang Padang beach also known as a Labuan Sait beach is one of the best beach in Bali island. Bali Padang Padang beach is located at Jalan Labuan Sait, in the village of Pecatu, Bali. Located not too far from the tourist area of Uluwatu. Arriving near the entrance of Uluwatu Travel, we take the road turn right. Follow the directions, to see that underneath the bridge looks the beach. Upon entering the area of Padang-Padang beach, we passed a temple. Interestingly, to get to this beach, we had to descend the stairs are made in the cliffs. After a few yards down the stairs we are greeted by the sun. It turns a dark alley behind the beach there is incredible beauty. The waves that roll, rock-breaking waves, and the sky is captivating. Towards dusk, we could see a beautiful sunset view, as if the sun is swallowed by the ocean. Bali Padang Padang Beach is one of the best beaches in Bali in addition to dreamland, Kuta and Nusa Dua. White sandy beach stretching ahead of you, clear blue water and flat, perfect for swimming. Sand white color contrasts with the black rocks and blue sea exotic. The beach was clean, quiet atmosphere and crystal clear waters will make us feel at home after a long time to swim and sunbathe here. The more the light rays of the sun adds to the more exotic blue waters are shown. A bright blue sky and white clouds forming harmonization beautiful scenery. Visible in the distance the boulder clusters, this is so beautiful. Large boulders are scattered along the coast. Around the stretch of sand beach, you can find some tents that sell food and drinks, and renting surfboards. The extent of Kuta beach area is not, but this is what makes this beach so special. If you enjoy the sunset at the beach with a few other visitors around you it will feel like a private beach. The scenery was almost similar to the views of the beaches in Thailand. Although the standard has a secluded beach for a shore facility from the shower, toilet, as well as lifeguard or lifeguards. Padang Padang beach is popular starting around 1996's from the music group Michael Learns To Rock took this beach as one of the set of their video clips. Not long ago, actress Julia Roberts is also shooting at the beach for his new movie Eat, Pray and Love that has been released in 2010. Previous: Bali Water Sports And Uluwatu Tour.